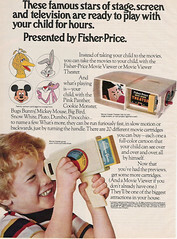 The MediaLog was the proud owner (still is, actually) of one of these Fisher Price Movie Viewers from circa 1980. This is one of those items that when I encounter it--say, happenstance in an image on Flickr--strong, warm feelings from childhood are evoked. Such is the definition of nostalgia, I reckon. I did not have the more elaborate one in the upper right with the small, Movieola-like screen, but rather the handheld one that the kid--who might have been me--is enjoying. I even had (and have) the same cartridge, "Lonesome Ghosts," a Disney cartoon featuring Mickey, Donald and Goofy as Ghostbusteresque sleuths. The handcrank motion of the Movie Viewer allows you to play the movie in slow or fast motion, or to go forward or backward a frame or two at a time. Reflecting on it, I think that my experience and fascination with these capabilities of the Fisher Price Movie Viewer set in place a foundation that would later blossom into my interest in studying and analyzing films. Chris' MediaLog is simply a place for me to post images, video clips, links, and short musings about all forms of media--movies, TV, magazines & newspapers, radio & records--and about things I find related to retro & nostalgia. My interest in classic television began in 8th grade with the books "Cult TV" (by John Javna) and "Total Television" (by Alex McNeil) and viewing many classic 1950s sitcoms on the old CBN cable network. A college major in film/media studies led to grad school, an attempted teaching career, and finally, a job as a public TV programmer. © 2006-2011 Chris' MediaLog. Simple theme. Powered by Blogger.